Bre + Smo had the most wonderful witchy winter wedding at Oak Grove in Columbus, Ohio. It was colorful, unique and downright badass. 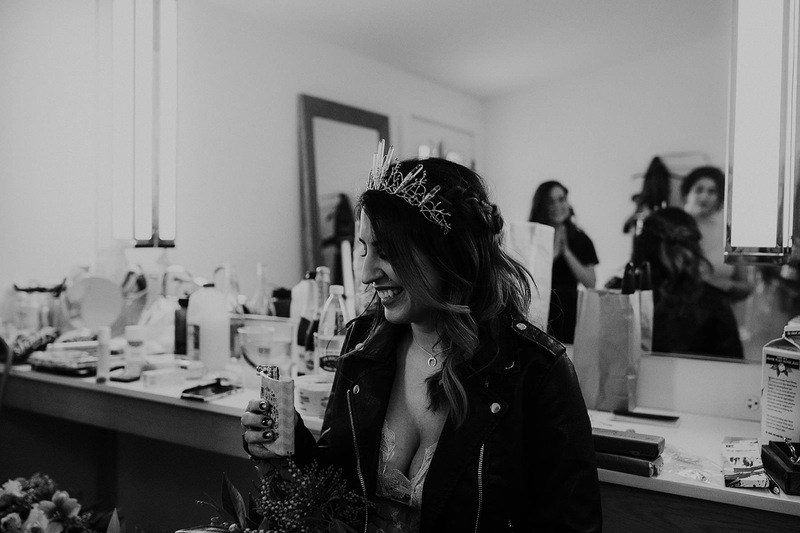 Bre rocked a killer crystal crown, a leather jacket over her dress AND can we talk about her dress for a second?! Holy wow, amazing! Smo killed it in his light grey suit and silver paisley tie!! P.S. Can we all collectively agree that these flowers are insane, shout out to Bear Roots Floral!! Their day was filled with the people that they love the most, their friends and family. One thing I love about weddings is how it brings everyone together to celebrate the love and marriage of two of their friends, it’s truly a beautiful thing if you sit and think about it. Their bridal party was insanely awesome! They even went along with my ideas for making GIFS (if you were a part of Bre + Smo’s bridal party - you are awesome!!) Bre’s “Witches Coven” was dressed in gem tones and Smo’s crew was in silvery grey - such a great color pallet if you ask me! The bright hues on a cloudy winter day made everything just that much better! against the dark fog of this molting summer. I touch your wrist with my wrist and et them confused. and look up at a sky that’s just a smudge of your iris. that we will always be in love with one another. and a blue jay laughs overhead. After spending the day with them, this poem encapsulates the love they share with one another, poetically beautiful! After their ceremony all of their guests went inside for cocktail hour while we went to do some more portraits of the lovely couple. At cocktail hour they had tarot card readers reading guests cards, such an awesome little touch to the day!